So, it’s been a while since I’ve sewn anything fun for myself. Actually, scratch that, it’s been a while since I’ve sewn anything for myself at all. I’d fallen into a bit of a sewing rut, and after last year’s awful summer, I hadn’t had much energy or desire to sew anything at all. This whole year I’ve really only touched my machine when I was doing skating costumes for others. But despite the lack of motivation, I haven’t had any lack of ideas, and when I was able to get tickets to this year’s San Diego Comic-Con (I have really awesome friends! 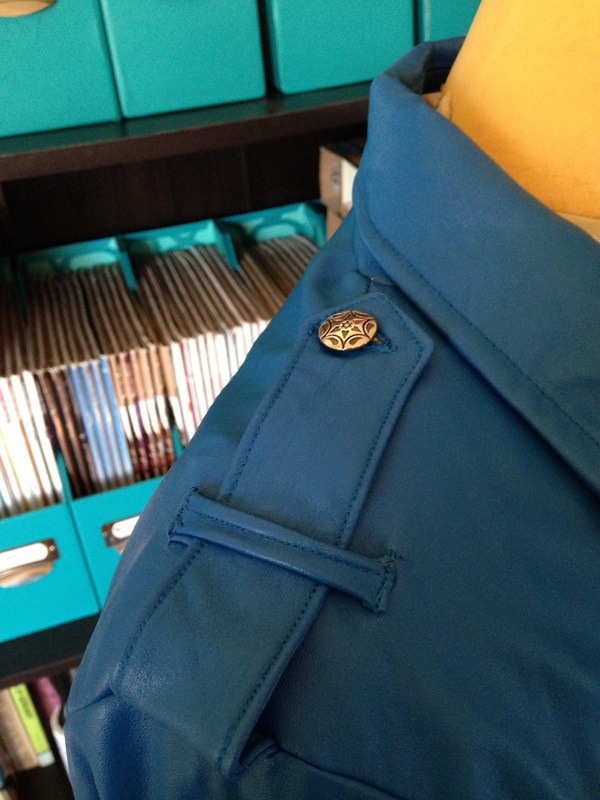 ), I was inspired to sew a few things the week before I left. 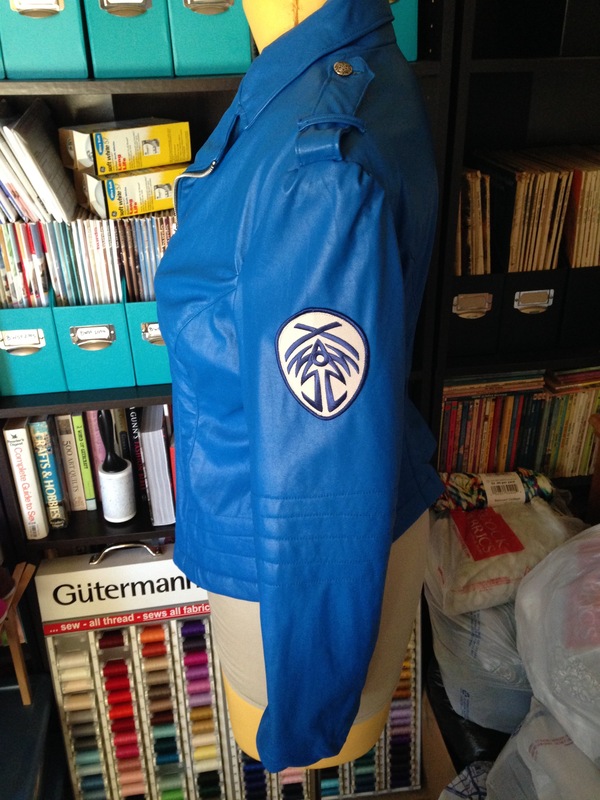 The first was an awesome pair of TARDIS PJs (post to come), and the second was something I’ve been wanting to sew for a while – a biker jacket inspired by Brandon Sanderson’s Stormlight Archive series. 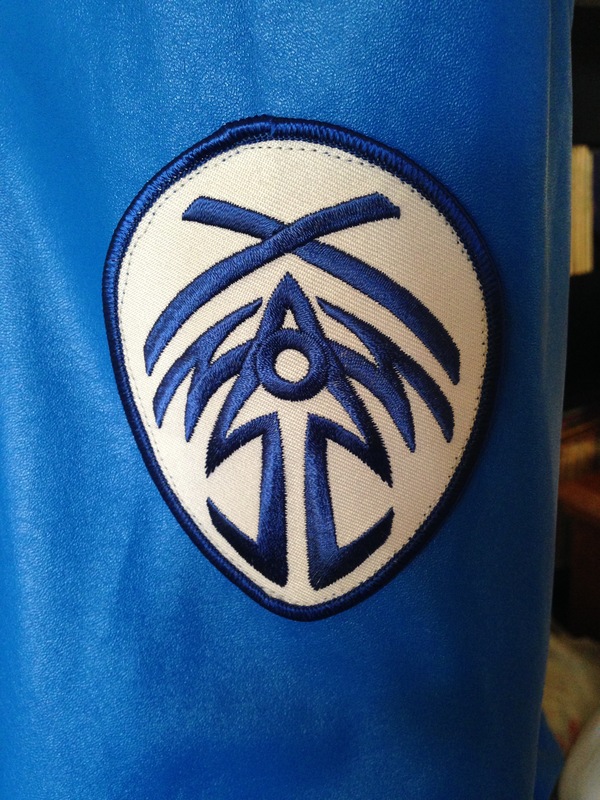 In the books one of the main characters eventually becomes a guard, whose uniform consists of a blue coat with silver buttons and white lining, and the symbol for Bridge Four (and his old way of life) as a patch on the sleeve. While I very much want to create a book-accurate (gender-bent) version of the costume, I also really wanted to make something that I could wear in “the real world.” I’d been inspired by the cute ideas at DisneyBound, and thought, well, maybe I could do a StormlightBound? Or, more broadly, BookBound? (Hehe, puns.) Though I guess this idea could also fall under the “casual cosplay” category as well. In any case, with all of these ideas bouncing through my head, I thought: Kaladin – as a modern day biker chick. Yeah, I can rock that. I will admit to having bought 3 different blue leather and/or vinyl fabrics before finally finding this bright blue fabric in LA’s garment district. It was just sitting on a street corner and the seductive $10/yard price tag didn’t hurt much either. 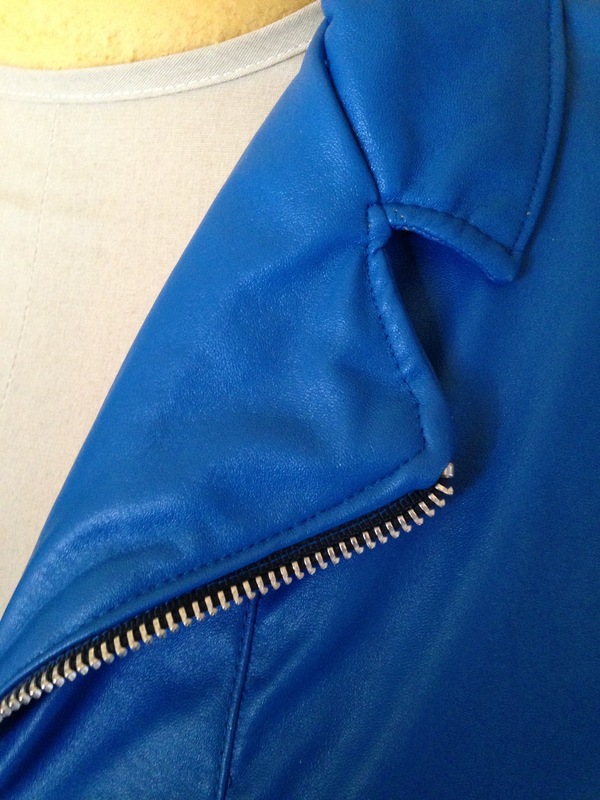 Which means I’ve got a nice stash of blue faux leather right now. I bought the zipper from Wawak, and I also bought the tools to shorten it. It was the first time I’ve ever properly shortened a metal zip – it was actually much easier than the video I found on YouTube would have suggested. I tried to keep all of my metal bits silver to be in line with the colors scheme from the book. 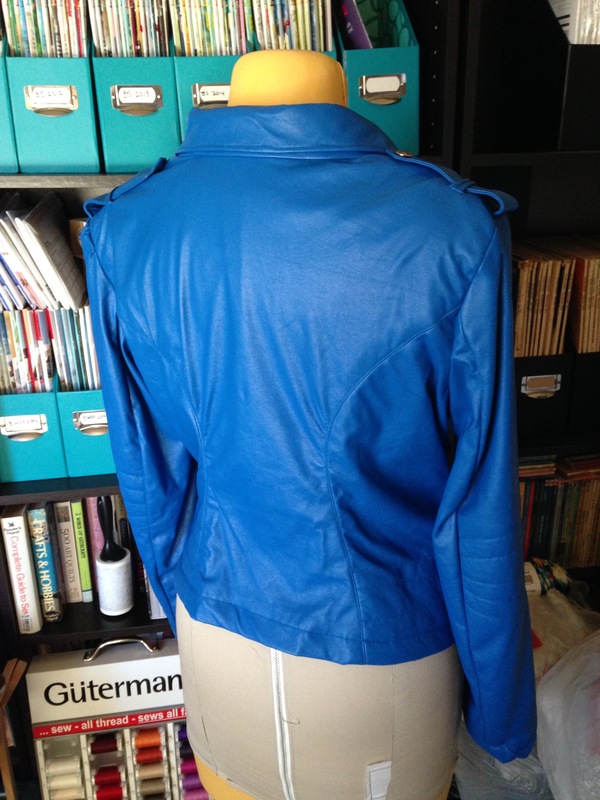 I was actually really pleased with how well my zipper turned out – it sewed into the jacket like a dream (second photo). It was also my first time using fusible batting. 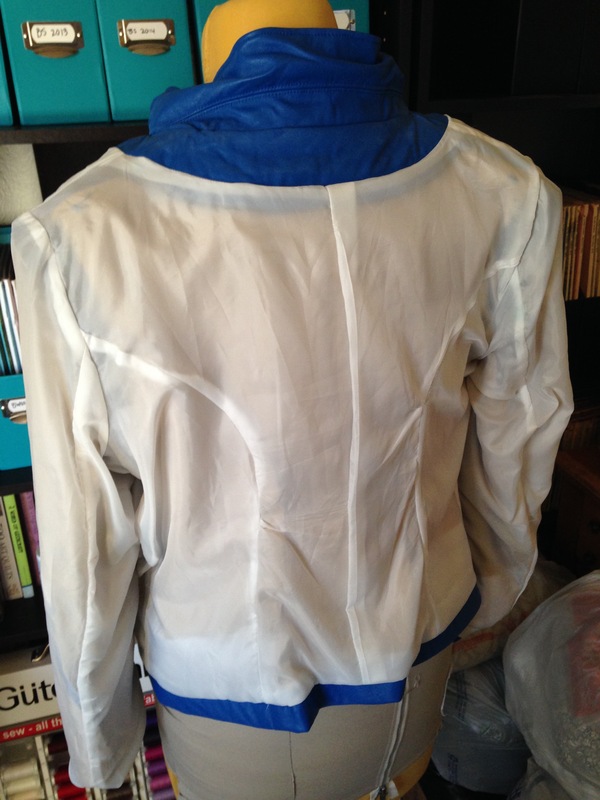 Or, well, interfacing approaching the level of fusible batting in any case. 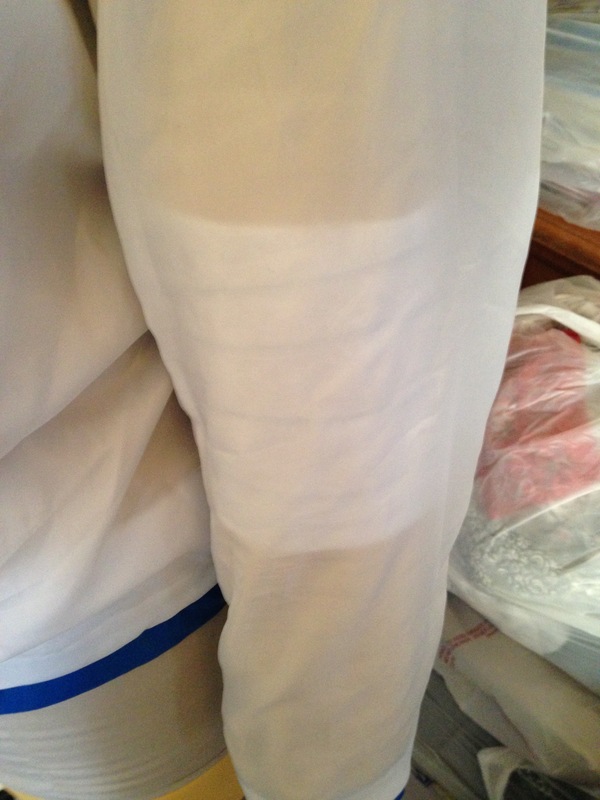 It gave a nice dimension to the topstitching details on the sleeves and hem (visible in the last picture). I used French seams on the lining (eighth photo) because I am tired of all of my lining fabrics fraying after minimal usage. Naturally, all of the hemming was finished on the floor of the hotel room the night before wearing my jacket at the convention. I really loved the shoulder tabs and topstitching details,but of course my favorite thing about this jacket is the Bridge Four patch that I got from the Brandon Sanderson official store. Oh, and the best thing about this jacket? I got free swag from Brandon Sanderson himself at Comic-Con! I didn’t have any books for him to sign (I’m waiting for his next release in October), but I got a bit of Steelheart promotional material for bringing my own swag to the Con. Too cool! 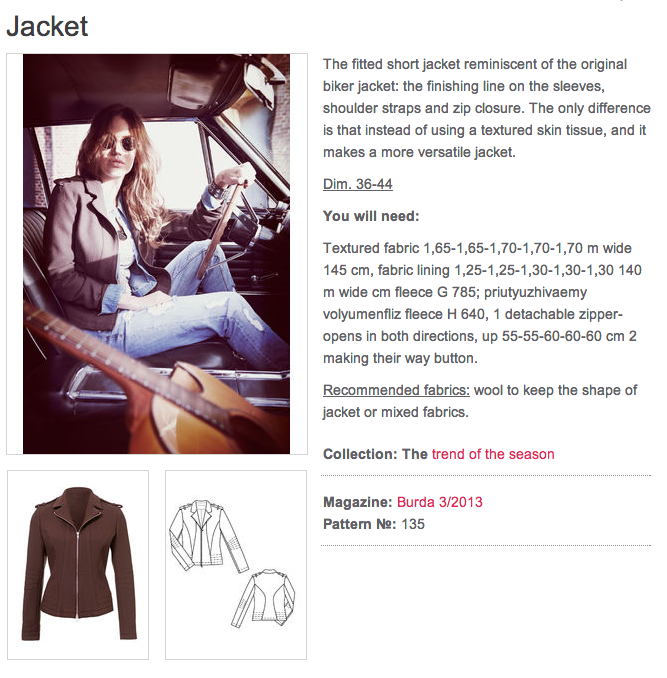 Pattern Description: A zip-front biker jacket with topstitching detail. Pattern Sizing: Burda sizes 36-44. I used size 44, but made a few alterations for fit (see below). Were the instructions easy to follow? Yes, I thought that these instructions were pretty easy to follow for Burda. The only tricky bit is the collar. Did it look like the photo/drawing when you were done with it? I think so! I was very pleased with how it turned out. What did you particularly like or dislike about the pattern? I love the style, with the topstitching and zipper details, and the interesting seam lines on the front of the jacket. The only downside is that it doesn’t have pockets, which I normally really like to have, but since this was more of a “casual cosplay” sort of piece I don’t mind not having them too much. Fabric used: Some sort of stretchy blue vinyl from downtown LA. The lining was a basic white poly lining from Michael Levine in LA. It isn’t too heavy, but it doesn’t breath very well. It sewed up better than I expected (I used a teflon foot), except in areas of large amounts of topstitching, where the vinyl got a little worn off the fabric. 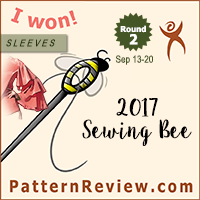 Pattern alterations or design changes you made: I did a 1.5″ swayback adjustment, and I added 1″ of width to the sleeves (by adding 1/4″ to each seam). I I should have lowered the hem in the back as part of my swayback adjustment, but I didn’t because I thought the high-low hem had an interesting effect on the shape of the jacket, and I liked where it hit in the back. I will probably add the inches back to the pattern so it will have an even hem if (well, when) I make another one. I also did french seams on the lining, even thought they weren’t called for, because I am tired of my linings fraying to bits after minimal usage. Would you sew it again? Would you recommend it to others? I would totally sew this again! Perhaps in a black or a nice deep brown? 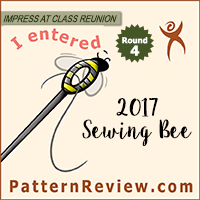 I would definitely recommend it to others – it was surprisingly easy to sew, it has some lovely details, and a comfortable, relaxed fit. Conclusion: Love this pattern! I’ve been excited about it ever since the magazine came out, and I think the pattern and fabric choice were perfect for what I wanted to create. I love my jacket and I expect to get a lot of use out of it in the future. Although I made this specifically to wear as part of a BookBound/cosplay ensemble, this post has given me some inspiration for how to incorporate it into my everyday life a bit more easily. Now I really am thinking that I’ll be able to get a lot more use from the jacket. I love it. What’s even more – it’s got me sewing things I’m excited about again. And that is the best feeling in the world. This pattern has been on my list for a while too (eek 2.5 years I guess! ), maybe this is the year I finally get to it. Your jacket looks great and very wearable outside of ComicCon too, rather than… I don’t know a jedi costume or something. The tip on using extra interfacing for the topstitched parts is one I will try and remember to use. I’ve adored this pattern since I saw it, and hope to get good enough to sew it one day. Looks like it turned out well! do you have other photos? All my other pictures are of me at events – usually group shots that are dark or blurry. Not the best for showing off the jacket! 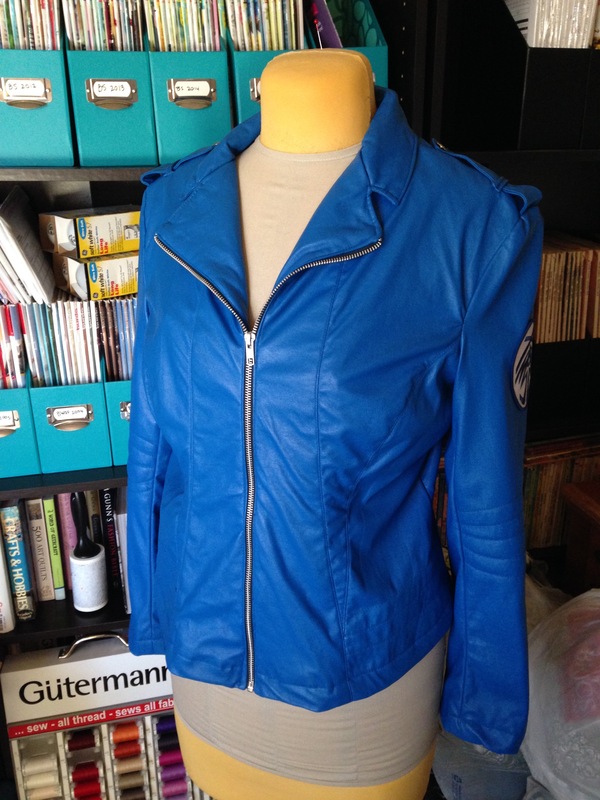 Also it was surprisingly easy to sew for a jacket, so I’d say go for it! It is a great pattern. I think this pattern would be great for any medium to slightly heavy weight fabric. 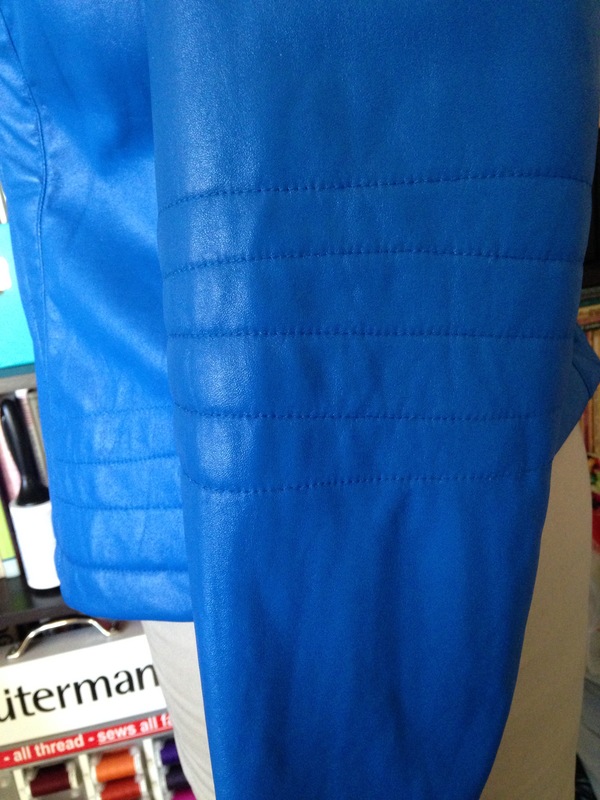 The fabric I used was quite thin, but I used lots of interfering on the structured/tailored parts. I also used fusible batting as suggested for the stitching details, so I recommend using that too. But your fabric sounds good, and if you worry about it being too lightweight you can always underline with silk organza (or muslin in a pinch) for a sturdier feel. A layer of muslin adds a lot of warmth too.